I bought my DVD of the 2013 version from Penguin Magic here. The nice thing is that in addition to sending you the DVD of the new edition, Penguin Magic also gives you access to a digital download of both the 2003 version and the 2013 version, so you get the best of both worlds. Both videos are videos in *.mp4 format, with the 2003 video being 753 MB in size, and the 2013 video being 1.43 GB in size. So what's the difference exactly? Well for starters, Oz himself is now 10 years older, and has a lot more professional experience under his belt. He has a new look and even a new smile. Everything has been re-filmed and the explanations have been re-done from scratch. Most of the content covers the same material, but not exactly - I'll mention what exactly those differences are in the next section. For those unfamiliar with the original DVD, here's are some screenshots of the menu of the new version, which show the entire contents that you'll find on the 2013 edition. I'd love to know what others think. Have you seen the original or the new version of Oz Pearlman's Born to Perform Card Magic, and if so, what did you think of it? And if you've seen both, would you consider the 2013 version to be an improvement on the 2003 version, or is the original one better? How is the crediting, Enders? Considering the content, I think it's decent. 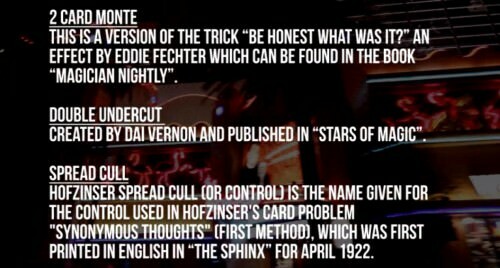 There is a section at the end of the video called "Recommended Resources" in which Oz says he is standing on the shoulders of giants, and he emphasizes that crediting is very important. In that context he mentions obvious titles like Royal Road, Erdnase, Giobbi, which he has learned from. He also says that he can't credit every single person that all this material came from, and that's a fair point, because this video is basically a course in the fundamentals of card magic, and you'll find explanations of moves like double lifts and palming in tons of books. Even so, he has included a bibliography at the end to acknowledge some of the main sources, and he encourages viewers to check that closely. 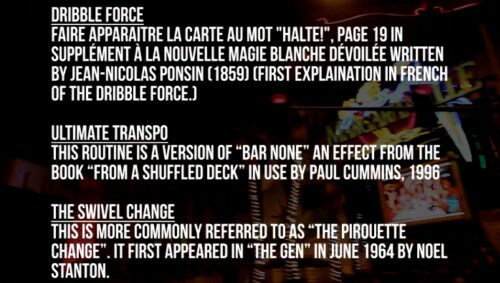 For example, he provides a main credit for each of the phases he uses in his ambitious card routine. He even gives a reference for each of the standard sleights he teaches like the top palm and one handed top palm. Here's a couple of screen shots so you can judge for yourself. Wow....today I learned that the double undercut was created by Vernon. I just kinda assumed it was just...a normality in magic.